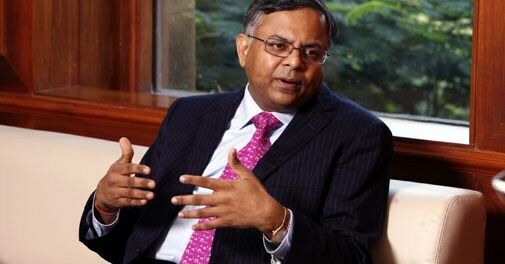 N. Chandrasekaran, CEO and Managing Director of Tata Consultancy Services talks to Goutam Das about his personal life, people management skills and the company's future targets. Q: Tell us something about the people who influenced you. A: One of the early influences on me was my father Srinivasan Natarajan. He said whenever you spend some money, write it down. And you have to be honest about it. Simple things he taught me include reflecting, frugality, being honest in terms of what I do. I grew up in a small town. Every time I wanted to do something, he would ask if I was committing myself for the long-term or was it for the short-term. He would say whenever you have to do one-off things, you don't have to think much about them. Long-term commitments have to be thought through. From him I learnt perseverance, thinking beforehand become committing. Then I have also been influenced by my teachers. I still remember when I was moving from the sixth to the seventh standard, I could not attend classes for two and half months because I had to go through a small surgery. My class teacher, Kannammal, kept complete notes of every subject for me. I was a good student, a class topper. This was in the government school in Mohanur. In a way, it had an influence - what it is to look after people. The teacher didn't have to do that. I didn't think about it so much at that time. Many of these things come to my mind now. Now, I think about what it means to care about people. You work in a team. Somebody or the other will always need help. It is importnant to spend the time to solve his problem. A: My father was a lawyer by profession but then he came back to manage our family farm because my grandfather died at the age of 55. We were six siblings. We all grew up together and all my brothers and sisters have had a huge influence on me too. For instance, my eldest sister was exceptionally good in Maths and English. That was an influence. I saw her scoring 100 out of 100 every time. My eldest brother was extremely hard working. I wouldn't say I worked very hard. A: I worked okay, but not very hard. Q: Where are your siblings now? A: One of my brothers is in the software industry, the other brother is a CFO. Sisters are all housewives. Q: What happened after school? A: I went to Trichi to do my plus two because I wanted to switch from the Tamil medium to English medium. The government school was a Tamil medium school. Then I went to Coimbatore to do a course in applied sciences and then to Regional Engineering College. Q: Were you a good communicator back in those days? A: Since my school was a Tamil medium school, most of the communication was in Tamil. I used to participate in debates. I was good in communication. I gave up participating in debates when I moved to the English medium school because the debates there were in English. So I was not comfortable. I could communicate in English but was not very eloquent. I had great interest in Tamil literature. I still read Tamil literature, but once in a while. I would have been extremely happy studying Tamil literature. Q: Why didn't you do that? A:(Laughs) You are always told to do Maths and Science. My father wanted me to do a graduate programme and then come back and do agriculture. So I did my science degree (applied sciences), moved back home and tried agriculture for six months. A:I managed the farm. I went with my father in the morning. We grew bananas, rice and sugarcane. I tried it for six months but I was not happy. So I decided to pursue studies and went to REC to do my Masters progamme in Computer Applications. During my last year, I came to TCS to do my college project. Then I was interviewed by F.C. Kohli. Q: What were your influences at TCS in the early stages of your career? A: I enjoyed every project I worked on. I had a lot of influences from among the clients. In 1993, I worked on a very large federal government programme and we did a spectacular job. The first phase of the programme was completed. The second phase was completed and was going to go live. That morning, the client manager who was my interface came and said he wanted to go for lunch. I told him that the system was going live now and I had to stay. But he insisted we go for the lunch. I was very restless in the car. There were no mobile phones those days either so no one could reach me. He said we have done a fabulous job but he needed to find the guy who could step into my shoes. By taking me to lunch, he would find out because somebody would handle the job when I wasn't around. It is about taking risks, trusting people - so this guy had a big influence on me. Q:Was there a moment during your career when you had the inking you would land the top job? A: There has never been a dull moment. I know I was doing very well. But it was not that I had to be this or that. But in the last two-three years before I became a CEO... I was appointed as the COO in 2007. Then you know you are one of the candidates. Q: At that point of time did you have any weaknesses which you worked on? A: Not consciously. As you grow, every year you improve in some aspect or the other. I started running around that time, in 2007. One of the things I would say is that I became a little more patient during that period. I was always a man in a hurry. Maybe it was a combination of taking up running (and other things). Running has had a lot of influence on me. I have become a lot more observant after I started running. I notice things much more now. Perseverance has increased. I have also become a much better listener. If you go back to my early years, probably I was not that good a listener. I don't know if it was only due to running or running plus the fact that I was shouldering more responsibility. In fact, contrary to what you would think, I really feel that I am not tense at all now. I used to be more tense as the COO and in my earlier years. Q: Was that an anxiety to deliver? A: No…. you think I have no anxiety now? Now I am in the public eye and everything is being debated and written about. I think it's partly my growing up and handling more responsibility and partly my running. I give a lot of credit to running, boss. I have become much calmer, a better listener, I don't get tense at all. Q: Your friends tell me you hardly lose your temper. Is that true? A: When you are not under pressure, where is the question of losing your temper (laughs)? I have never been angry with individuals. I have only been upset with situations. Over the years, I have also learnt that if I get upset, it is my problem, it is not somebody else's problems. It is not a question of you getting upset with somebody. If I know simple things that we should have done and we didn't do, I will be very upset. I will be very critical of it and I will sit down with the team and question it. But I have never been angry or upset at an individual. Q: What did you mean when you said you were always a man in a hurry? A: I want to finish things, I want to move. I like meetings, collaborations, etc but at the same time, one can't be endlessly debating. We need to move on. Q: There are two kinds of leaders. There are those who have the broad vision and then there are those who micromanage. Some say you blend both these styles very well. Is that a good way of describing your style? A: The way to look at it is that I work with a lot of people. Everyone has strengths. Everyone has a style. Over the years, I have learnt that one way is to impose your style on people - tell them I am responsible, I like it done this way, etc, and everybody has to do it that way. But this puts a lot of pressure on people. People will not be themselves. Some will need you being in touch with them on a frequent basis. Some people will get very worked up if you are in touch with them frequently. So I balance it. Since I came from the ground up, I understand the business and am hands on. I am a technical guy, so I understand the business quite well and stay in touch with what is going on in the industry. But I agree on what needs to be done, the rules of the game and what is the path we want to take - I communicate that very clearly. After that, I let them be. But I am always available. Q: So it is a personalised way of dealing with people? A: It is not personalized to the extent that there are 20 different models. It is a band and you got to move in that band. It is very important to give people the space. For me it is not about micromanaging or not micromanaging. It is the need for me to give the space for people to operate in the way they want to operate. Q: The other thing that came out in discussions with your executives is that you are never happy with the targets they set for themselves. You often give them a cricketing analogy, from T20. A: Absolutely. Many times I feel that setting a target can be the most limiting thing. You go into a pitch in the morning and say this is a good pitch for 160 runs. But for all you know the pitch could be good for 220 runs. So once you set your mind on a target, you are kind of limited by that target. Q: So how does TCS go about setting targets? A: So the first thing I say is that you've got to aspire. I allow them the freedom to come out with unreasonable goals and then go for it. But I don't criticise them if they fail or fail miserably. It is fine with me. But we are also operating in the market so we know based on the data that we have how much we are likely to achieve. That becomes the target from a quarterly point of view but everyone knows that's soft. A: I have not counted but I know a lot of people. Q: How do you remember someone working on a particular technology in a specific project from among the thousands at TCS? A: Because either I have reviewed the project or I have heard about that particular project. Many people who have worked with me are still in the company. It is very important for me to know the new things we are working on. So I keep track. If there is something interesting, I meet a few people working in that area. So I remember. If you are present in a meeting, even if it is a two-minute meeting, you don't forget the person or what was discussed. But if you are not present, even if it was a one hour meeting, I don't think you would remember anything. I try my best to be present. Q: How is your connect with the bottom of the pyramid people, the freshers or the 'three-years of experience' employee? A: It is becoming harder (to have a connect) because we are very large. I used to do a lot of reviews five - six years before. I used to go to each location and spend a day, morning to evening. So I used to meet a lot of people, project teams, meet high potentials, walk the floor. Today, I can't do all these to the extent that I cover the entire company. Now I am thinking of adopting social media in a big way. That's my goal for next year. Q: What is it like to be a Tata group CEO? A: It is two things. The group is professionally managed so I get to run the show. For me it is the enormous freedom to operate and accountability. Then there is the strong value system of the group. A: A fantastic platform. Both the CEOs before me had long innings. The company's DNA, the delivery mindset, is extremely strong. Q: TCS has got used to long stints at the top. You are 50 and so you can have a long stint as well. Is that the way forward for TCS? A: As long as there is energy in you and as long as you are delivering performance, strategically building the company for sustainable long-term growth, providing the right leadership, and people below you are looking up to your leadership, it is good to carry on. A: I generally sleep well (laughs). But I worry about a lot of things. We have an unique opportunity and if we don't exploit that, that will be a problem. We are operating on a very huge scale. We will continue to scale up. How do we manage that scale, the complexity, the diversity? On one side, you have to leverage it and on the other side, you have to manage it. And then, what future business models will evolve? We are talking platforms, products, non-linear etc. but there will be an evolution of this industry. So we have either to lead that or whenever we miss it, we have to be fast in catching up. So we have got to be observant, attentive, we should not become risk averse, we should make bets, should be willing to fail. We have got to maintain that culture. These are the things I think about all the time. I don't know if I worry about it. Q: What is next for TCS? A: Nobody knows the future. But I would say there are a lot more opportunities going ahead.